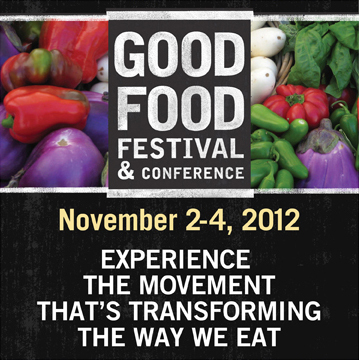 (SANTA MONICA, Calif. – Oct 9, 2012) – The Good Food Festival & Conference returns to Los Angeles for the second year Nov. 2-4, 2012. Produced by FamilyFarmed.org in cooperation with the Santa Monica Farmers Markets, the conference focuses on regional and national issues that are integral to building local and sustainable food systems and educating people about the Good Food Movement. The Good Food Festival & Conference begins with an “Urban Barn Raising” with pioneering urban farmer Will Allen on Friday, November 2 at John Muir High School, continues with The Good Food Conference, a day of informative panel discussions at the Los Angeles County Museum of Art (LACMA) featuring speakers such as Will Allen (The Good Food Revolution), Laura Avery (Santa Monica Farmers Markets), Andrew Kimbrell (Center for Food Safety) and Evan Kleiman (Good Food/KCRW) on Saturday, November 3 and culminates on Sunday, November 4 with Localicious, an evening of food and wine tasting on the beach with 30 chefs and 30 farmers at the Annenberg Community Beach House. Programming for GGFC will focus on issues that matter to Californians, such as community building, safe, healthy and economically viable food jobs and the California GMO labeling measure, Proposition 37. On Friday, November 2 from 10 a.m. to 5 p.m., MacArthur Genius and author of “The Good Food Revolution,” Will Allen, will host an “Urban Barn Raising” at John Muir High School in Pasadena. Members of the community, high school students and Allen’s team will construct a season-extending hoop house that will foster year-round education on food, agriculture and nutrition. The day’s activities will include workshops, farm fresh cuisine and one-on-one conversations with Allen and other influencers in the industry. On Saturday, November 3, from noon - 6 p.m., the prestigious Los Angeles County Museum of Art (LACMA) will co-host a series of panel discussions on building organic and sustainable food systems. •	Is GMO Labeling Coming to California? Confirmed speakers include: Andrew Kimbrell (Center for Food Safety), Arran Stephens (CEO Nature’s Path), Evan Kleiman (KCRW-FM/Good Food), Kelly Meyer (Teaching Garden), Laura Avery (Santa Monica Farmers Markets), Michael O’Gorman (Farmer-Veteran Coalition), Paula Daniels, Senior Advisor to the Mayor of Los Angeles specializing in Food and Water Policy and Will Allen (Growing Power, Inc.). Beginning at 10:30 am and throughout the afternoon on Saturday complimentary tours of works of art related to food and dining in LACMA’s collection will be offered on a first-come, first-served basis (Trade and the Changing Palette of the Dutch and The European Table Transformed, Dining Out in 19th Century France and The Age of Elegance). Admission to LACMA will be free of charge to Good Food Conference ticket holders on November 3. Localicious will serve as the culmination of the Good Food Festival & Conference on Sun., Nov. 4, 2012 from 6-9 p.m. at the Annenberg Community Beach House in Santa Monica. Guests will savor the freshest and best of the season with signature dishes prepared by 30 of Los Angeles’s leading culinary talents, paired with 30 farmers from the Santa Monica Farmers Markets including; Coleman Farms, Coastal Organics, Weiser Family Farms, Harry’s Berries, Schaner Farms, Gloria’s, Garcia Farms and Tutti Frutti. Confirmed chefs include Mary Sue Milliken and Susan Feniger from Border Grill, Akasha of Akasha, Nyesha Arrington of Wilshire Restaurant, John-Carlos Kuramoto of Michael’s Santa Monica, Jeremy Strubel of Rustic Canyon, Christina Olufson of Lucques/AOC/Tavern, Ray Garcia of FIG, Roxana Jullapat and Dan Mattern of Cooks County, Josie Le Balch of Josie, Gianfranco Minuz of Locanda del Lago, Paul Shoemaker of Savory, Bradley Miller of Inn of the Seventh Ray, Matt Dickson of FEED, Vardan Abgaryan of Public Kitchen, Collin Crannell of The Lobster and Joe Miller of Joe’s/ Bar Pinxto. For a complete list of Chefs and Farms, visit http://goodfoodfestivals.com/la/localicious. The Good Food Festival & Conference is produced by FamilyFarmed.org in cooperation with the Santa Monica Farmers Markets, support from the City of Santa Monica and the City of Pasadena and sponsored by Chipotle Mexican Grill, The California Endowment, LACMA, Whole Foods and Nature’s Path, KIND Bars, Cuties Juice, Café Luxe, Pali Wines and Edible Westside. Proceeds benefit FamilyFarmed.org. For more information, visit http://goodfoodfestivals.com/LA. Tickets and additional information can be found at http://2012goodfoodla.eventbrite.com. FamilyFarmed.org’s mission is to expand the production, marketing and distribution of locally grown and responsibly produced food in order to enhance the social, economic and environmental health of our communities. FamilyFarmed.org is nationally recognized for “growing the market” for local and sustainable food and works with many of the country’s largest buyers of local and sustainably grown food. The Good Food Festival and Conference was created to link some of the best local farmers and family-owned producers of food and farm products with the public, trade buyers and leaders in the field to foster relationships that facilitate the growth of local food systems. FRIDAY, NOVEMBER 2 – 10 a.m. - 5 p.m.
SATURDAY, NOVEMBER 3 – 10:30 a.m. -6 p.m.
SUNDAY, NOVEMBER 4 – 6 p.m. -9 p.m.